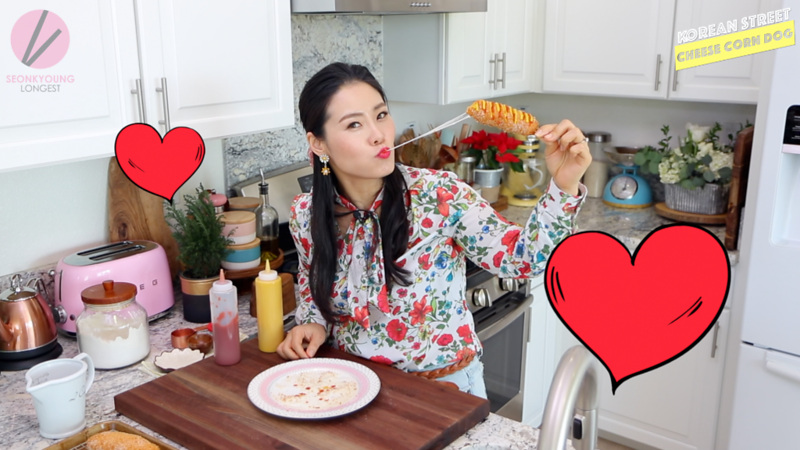 I’m super excited because I’m going to share another amazing Korean street food recipe with you!! When we went Dongdaemun, Seoul. 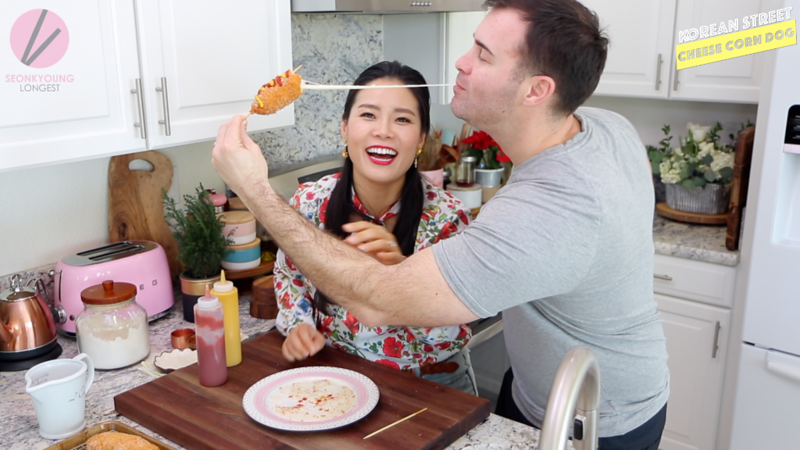 We accidentally found this amazing cheese corn dogs! 1. 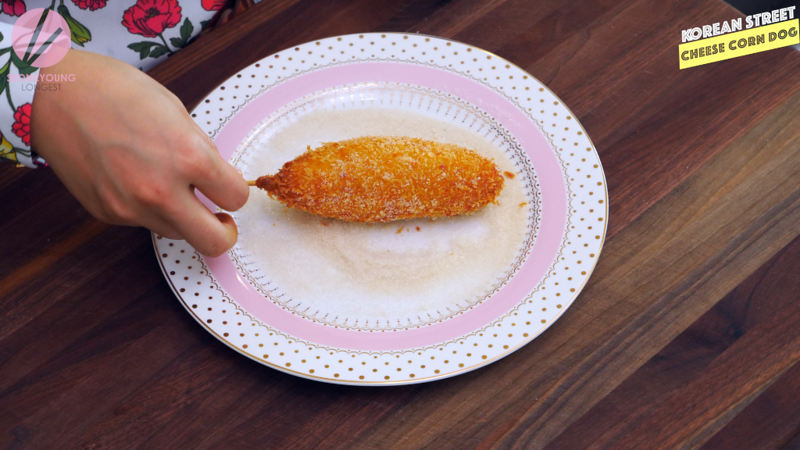 We coat the corn dogs with panko so it’s extra crunch outside! 2. After fry the corn dogs, we coat it evenly with sugar! Watch Life in Korea, Street Food Video! I know it sounds a bit strange, but TRUST me! It will be the best thing you’ll ever putting in your mouth! lol! 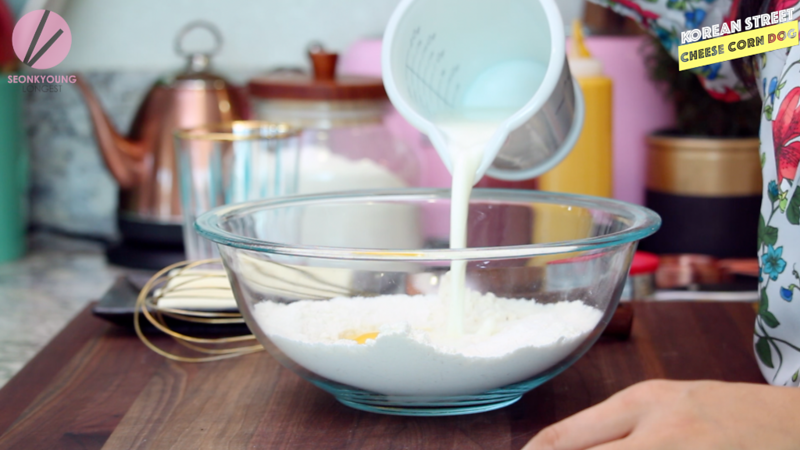 Let’s make the corn dog batter! 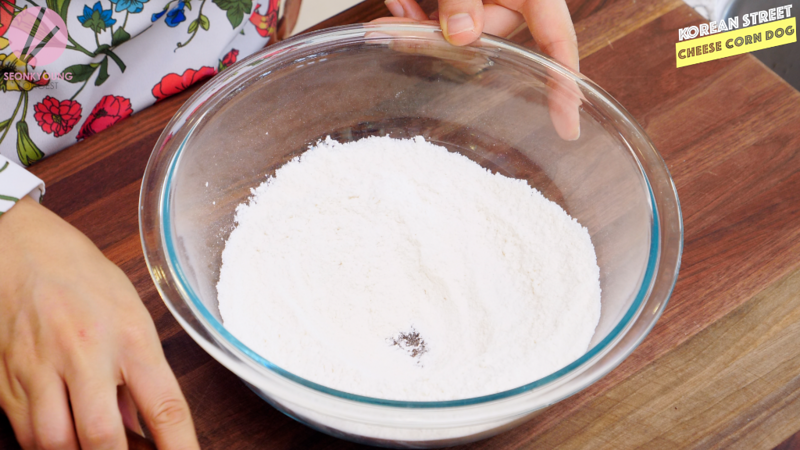 In a mixing bowl, whisk flour, baking powder, salt and sugar. 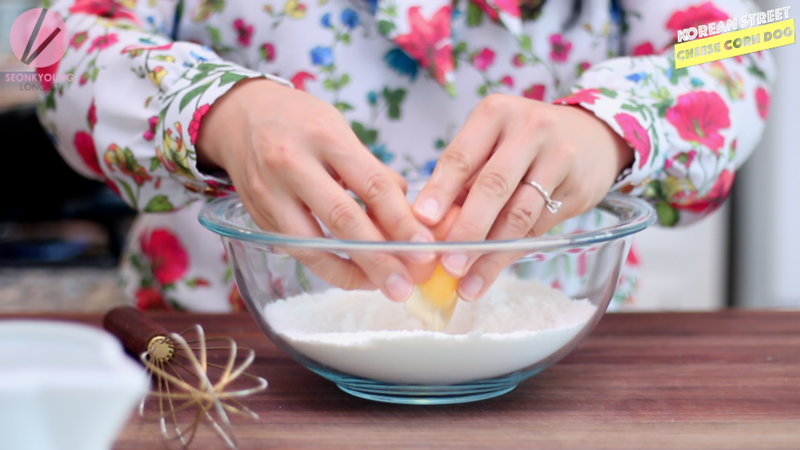 Make a little well in the middle and add egg and milk. Mix everything together until smooth. 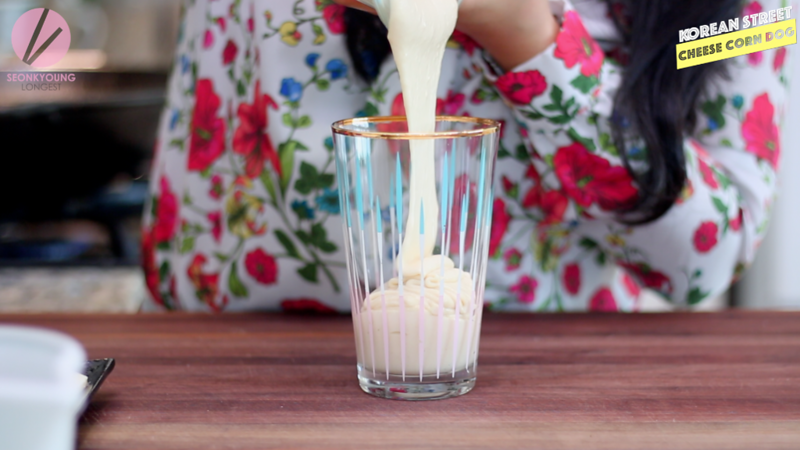 Pour batter into a long glass and keep it in a fridge until ready to use. Now, this step is very important! 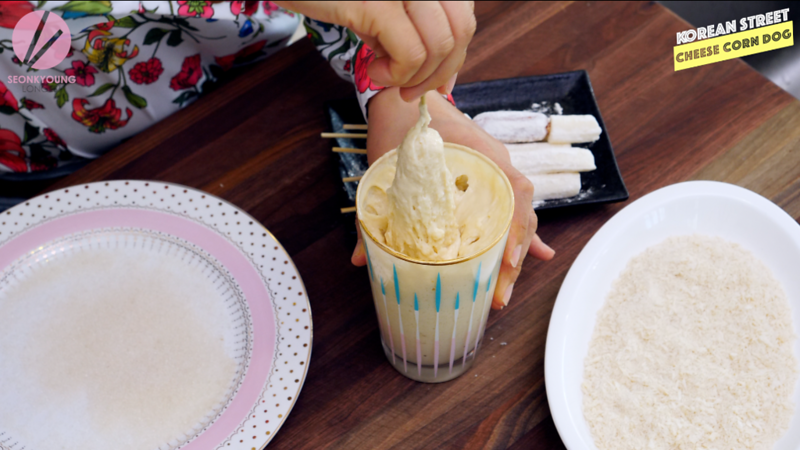 Keeping the batter cold is one of the key secrets to success this recipe! 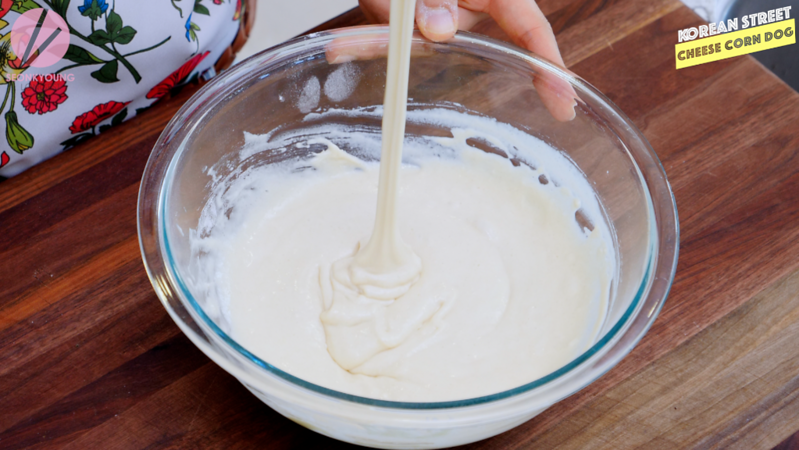 If the batter is warm, it won’t coat the cheese thick enough and become too runny. 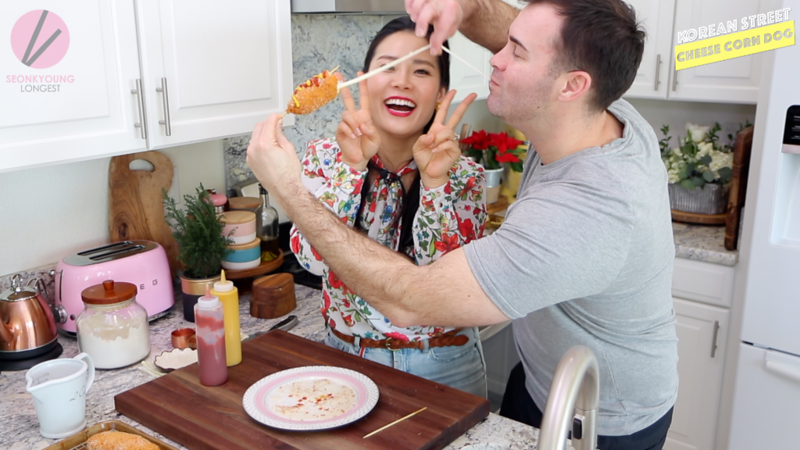 Skewer cheese sticks into bamboo or wooden skewers. Dust with flour and place in a freezer at least 5 minutes to 10 minutes. Now, this step is also very important! 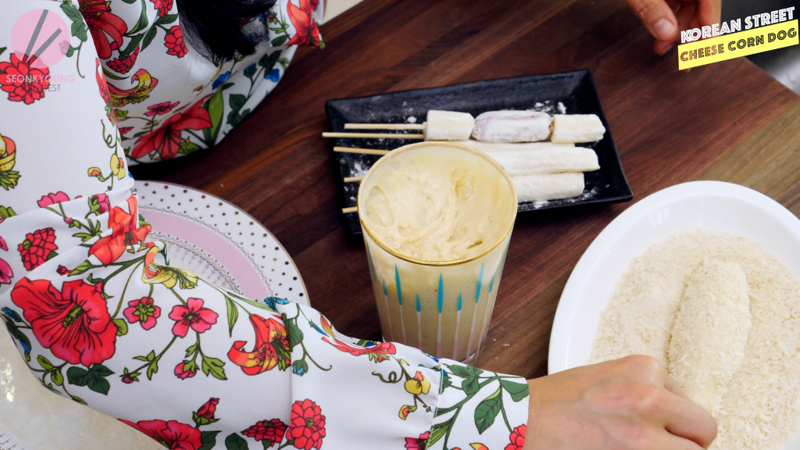 As I mentioned with the batter, cold temperature is the key for this recipe! it will melt way too soon than way before the batter cooks & turning into beautiful golden brown color. It’s very important to keep everything cold, otherwise, the cheese will leak out to the oil. 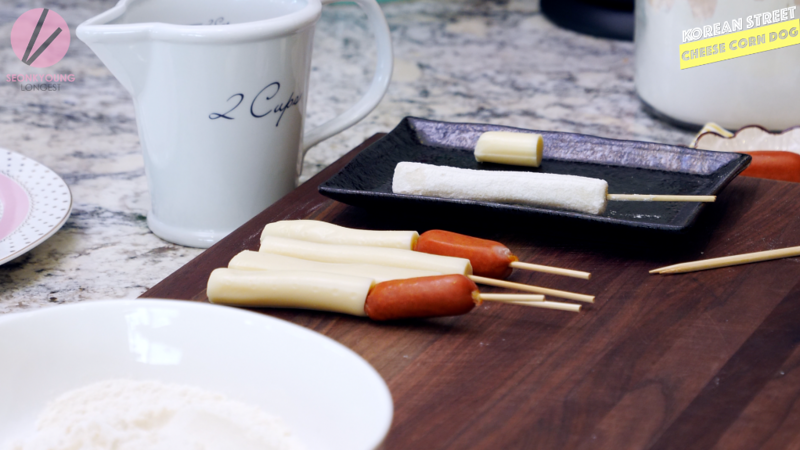 Dip and coat skewered cheese sticks with the cold batter. Make sure to cover all around. 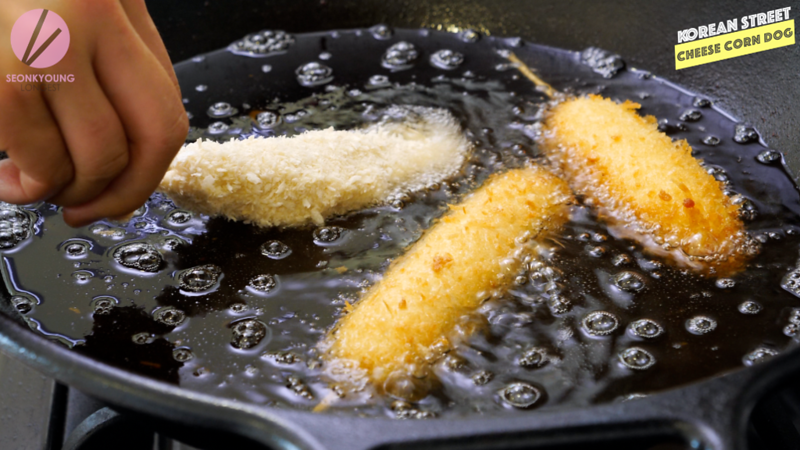 Now, lightly and quickly coat with panko bread crumbs then carefully place into frying oil. I promise you this is only last thing you need to remember for this recipe! You MUST keep the oil temperature in between 350°F to 365°F. It will cook the surface too slow and the breading part will be crack and open. The cheese will melt all over in to the oil. No one deserve that kind of mess. So remember these 3 things. Keep the oil temperature between 350°F to 365°F, no below. 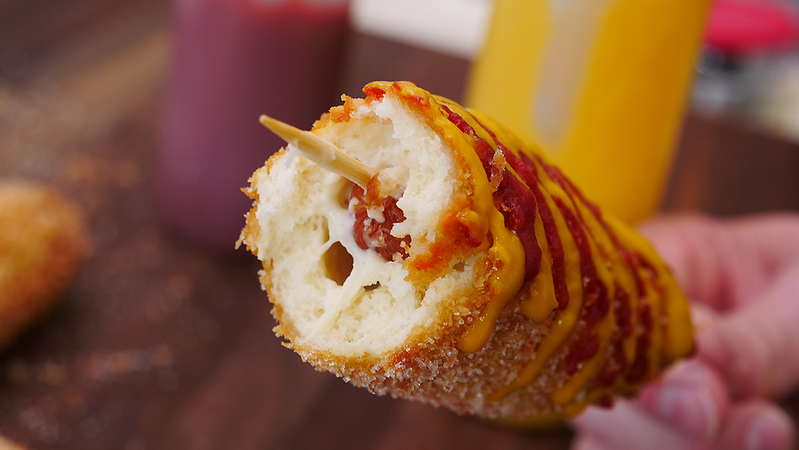 If you just follow that 3 simple rules.. you will end up this most beautiful cheesiest crispiest corn dogs. EVER. Fry for 5 minutes or until golden brown out side. 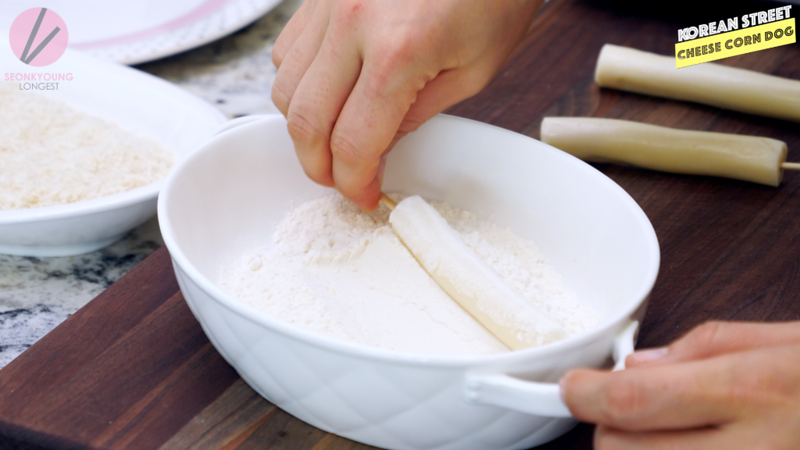 Remove form oil, place on a cooling rack or paper towel lined baking sheet. 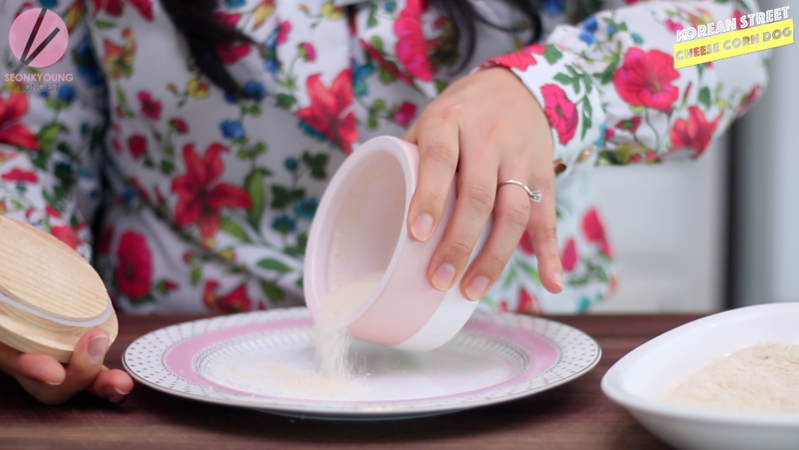 Spread sugar on a small baking sheet or a large plate. 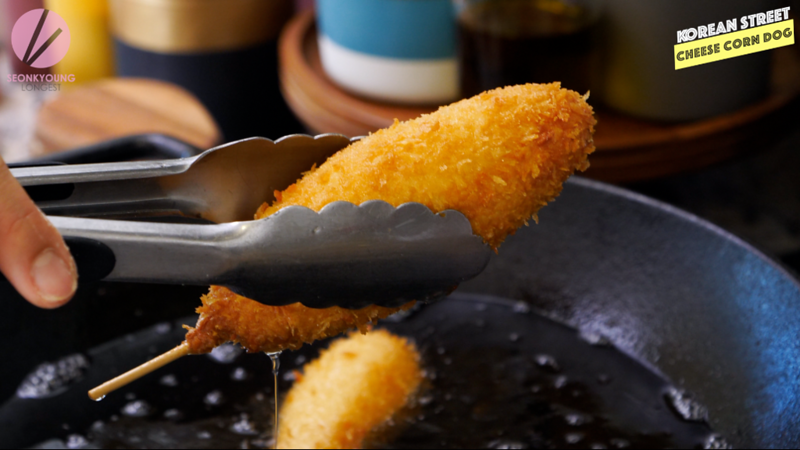 Roll cheese corn dogs on sugar to evenly coat while it’s still hot. 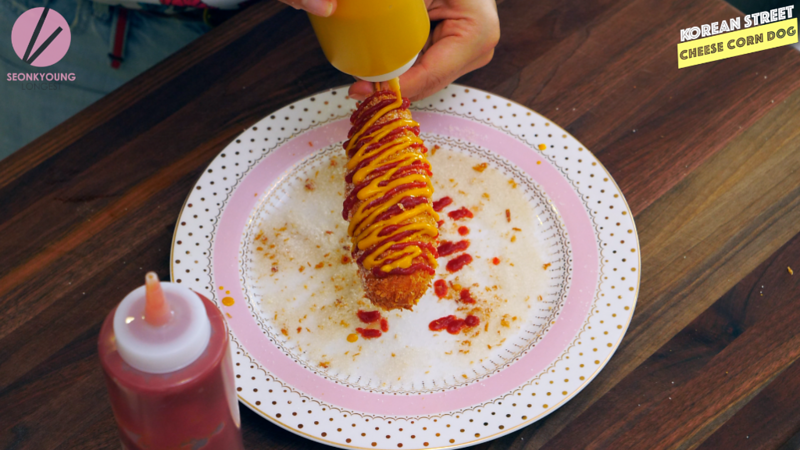 This is what makes Korean corn dog so special, so don’t miss out!! Enjoy with Spicy ketchup (half ketchup & half sriracha) and honey mustard as Korean street vendors serve! If you’d like to, combine cheese sticks with miniature sausage links! 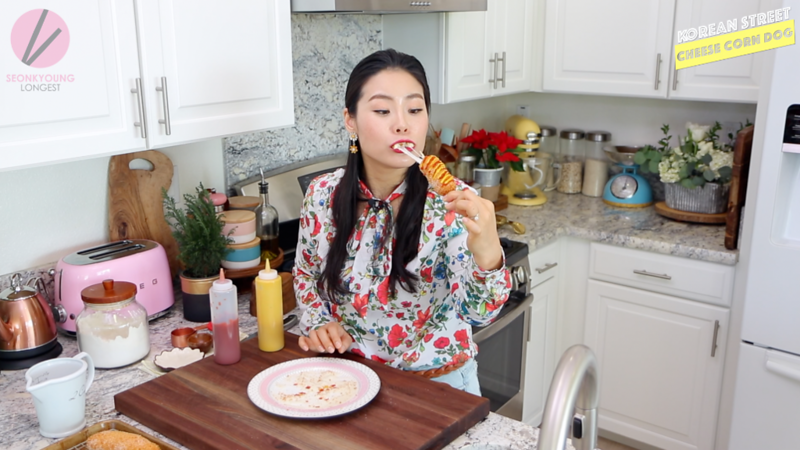 Enjoy with ketchup and honey mustard as Korean street vendors serve! 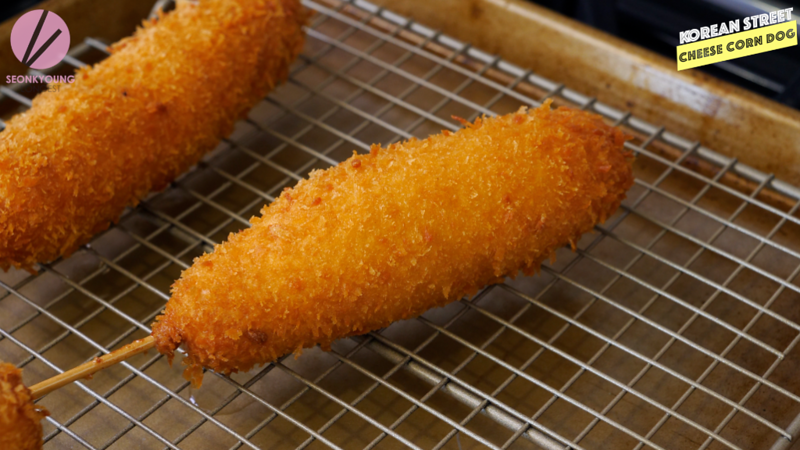 Just because it doesn’t have corn meal, doesn’t mean it’s not a corn dog. This is a called corn dog, in English, but called something else in Korean. 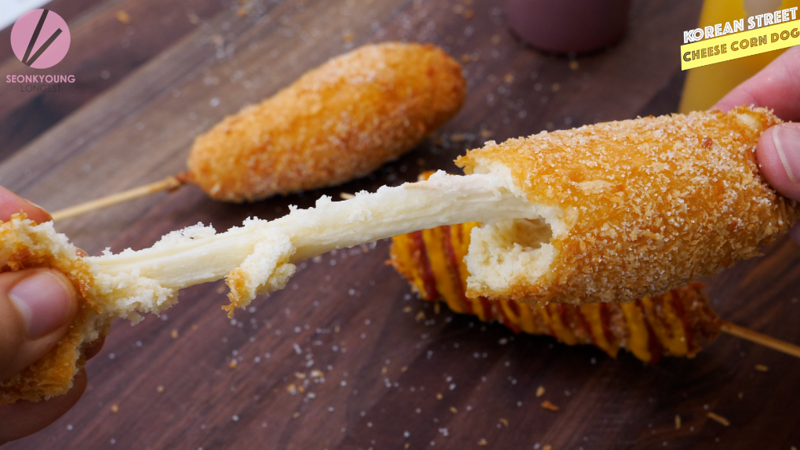 We define it as corn dog as a simpler term. A food can be made with many different types of ingredients. Try going out of the country, and try out some different delicious foods in the world that are not “cooked traditionally”. Why my batter cant hold its shape when i dip my sausage ㅠㅠ maybe i should adjust the milk ? I finally had the chance to try it out and boy was it delicious! I was out of panko crumbs and had to settle for bread crumbs but it still turned out perfect. I look forward to trying this recipe again, with panko coating this time 🙂 Thank you!!! Can i use a yeast for this recipe? How can I add the sausages to the recipe?